Have you ever seen a yardage book that PGA Tour Pro’s use? These books the guys on Tour live and die with are very detailed in the information they have within them. Every detail of the hole is outlined on the pages of these books; even the seemingly endless breaks and valleys of the green are noted. I’ve never gotten to actually play a round with a yardage book quite that involved, but I’ve often wondered what goes into making a book with that much detail. From the makers of VoiceCaddie is a new device that could be very beneficial to someone looking for this kind of detailed information on the greens they play. 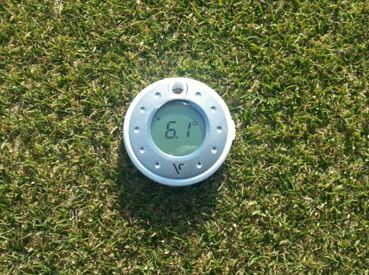 It’s called the Green Caddie – a digital green reader that measures distance and gradient of the green. 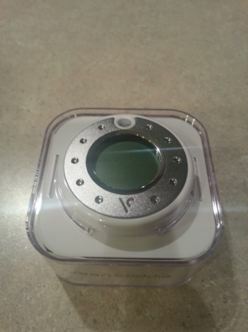 THP received one for review and I had quite a bit of fun using this cool little gadget. Immediately upon receiving the Green Caddie I was impressed with the packaging and how cool this device looks. It looks like a nice watch in the way it’s packaged in clear plastic. It comes with everything you need to know to use the device for reading greens. The Green Caddie comes in Silver, Blue, Green, Purple, Pink and Orange. It’s definitely a neat looking device that immediately sparks your interest when you see it. Speaking of using the Green Caddie, it is very simple to use. Push the button to turn it on and set it flat on the surface that you wish to read. It literally does not get much easier than that. It also has the ability to read distance to the hole. You can do his by holding the Green Caddie upright at more than a 45 degree angle for a few seconds and lining up the hole with a sight line on the device. It measures distance in meters and is most accurate within 30m of the hole, but will measure out further as well. I personally would have preferred that it measure in yards, but I did not see anywhere that could be changed. The Green Caddie is definitely very easy to use. It also seems to be quite accurate and easy to read. I had a lot of fun using it for testing; however I don’t see too many golfers really using this device on a daily basis. One reason is that the gradient of the green where your ball is might not be the same half way to the hole, or even at the hole. 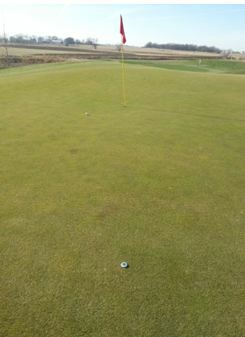 I think it gives you a good indication of where the putt is heading, but I can’t say that it gives a definitive line. While I don’t see it being something many leisure golfers would use often, I do think that tournament players would get a great deal of use out of one. Someone looking to build themselves a yardage book like I mentioned above will find the Green Caddie to be extremely helpful for mapping every detail of a green. I definitely think there is a market for the Green Caddie, but I just don’t see too many golfers using this on a daily basis. I would also have to think that the rules of golf wouldn’t allow it for tournament play, but I’m not 100% sure about that. Regardless, the guy looking to scout out a golf course will definitely benefit from having the Green Caddie in his bag. During my testing, I was able to get more familiar with some subtle areas of the greens I play on. I’ll continue to carry it in my bag and use it from time to time to learn more about my course as I go on. At the time of this review there is no mention of the Green Caddie on the company’s website www.voicecaddie.com, so I am not sure what the cost will be. Stay tuned to THP for more information soon. Nice info here Jake. I would agree that I highly doubt it is USGA play legal but like you said it could be very helpful for building a yardage book showing details of each green, etc. Great review Jason, as you said there is probably a market for this thing. I know personally if I had it, Id use it to help keep tracking of putting stats regarding distances. Great review Jason!! I dont think this is something I would want to use, basically for the reasons you described but it definately is an interesting item and would be great for the proper consumer. Nice Jake! Its seems useful and could be useful for plotting out a yardage book. I might look at someone side ways if they pulled this thing out on the green while playing with me. But its small and useful, thats what matters. Nice review Jason. I’ve thought about a device like this a few times. Nice to see someone come out with it. I’ll be checking one out. I’m pretty impressed here. You gave me two good reasons why I could potentially use a product I had little interest in. This could have really helped me figure out the general slope on a couple greens at my home course – the type that you look at and see the exact opposite break than what is actually there. Measuring putts is a cool feature too. Only negative I see is that the price seems a bit on the high end. Great review, Jake. From the first time you posted up some quick pics of this device I was intrigued. Nice little gadget, and like you said, can really help those golfers looking to scout a course and chart a green for a yardage book. I would be one of those in the camp of this not doing much for me. A device like this has a target audience and I am not in their sights! Good write-up on a product that some people might benefit from. I’ll just keep doing what I’m doing, and asking when I’m not sure! Thanks for the review Jake. It definitely is an interesting piece of equipment. I guess if you got into the routine of using it and figured out how it works best for you it could be really helpful. Price tag should be interesting for sure. I think you said about everything there is to say about this devise. It is very easy to use, but I would almost label it as a novelty devise rather than being something that would help someone’s score. The one thing I think would be useful is the little rangefinder built in for those that want to keep stats of how long their putts were and how many they made from various distances. For me it just seems like there are too many variables on a green for it to do any real good, like you said with a gradient change halfway or wherever to the hole its point is moot. I do like the fact that you can use it to get a readout of distance to the pin while on the green, that would be VERY helpful in testing putters so as not to have to walk everything off every time. Another great review, I could see myself using it before a big tournament round in practice, but not a regular basis. Great review jake. I kind of agree with you that I dont see the true value in this. I think its a cool device for someone scouting a course. but, for me…I just dont think it would get use. It does look like an interesting device that could be handy for golfers. I have my doubts though if it is likely to be used much by amateurs. Most weekend golfers don’t have time to place a device on the green and wait until it reads the break for them. It’s probably a good device if you place by yourself mid week without being rushed on the golf course. Does anyone know how much it costs? Very interesting tool there. I could see someone using this in preperation for a tournament if not familar with the course. That’s a pretty cool little gadget. Always wanted to build a few yardage books for the courses I play most. La marque de luxe française, une unité de LVMH, est prête à ouvrir son plus grand magasin en Chine à Shanghai le samedi, avec un escalier en colimaçon doré et sur invitation seulement rez-de-privé où les grands dépensiers peuvent obtenir leurs cheveux fait tout en rêvant des designs sur mesure pour sacs. Voice Caddie failed to find two smaller courses I play on – Keystone Links, and Marvel Rapids in Ontario, Canada. My Garmin device found both, and quickly.